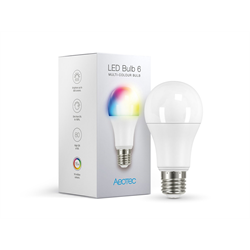 The Aeotec ZWA002 LED Multicolour Smart Bulb is a Gen 6 Zwave Plus enabled screw-in light bulb for use with most ZWave controllers. Choose warm wight, cool light or any colour of light you like with 16 million colours available. Use it at full bright or dim it to a soft relaxing light level. LED Bulb 6 uses a maximum of 9 watts of power while producing an equivalent light output to a 60W incandescent bulb. Instead of running at full power all the time you can dim the bulb for more enjoyable light levels and energy savings. 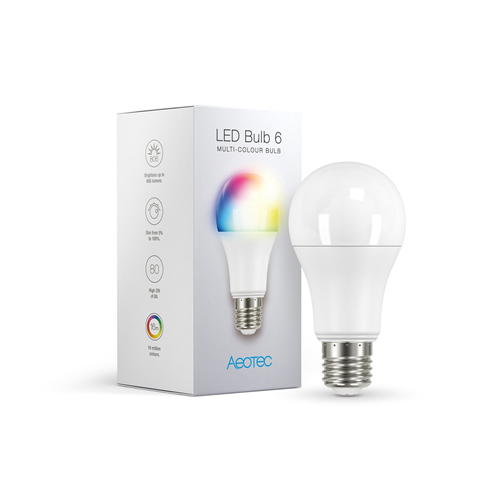 LED Multicolour Bulb 6 is compatible with most ZWave smart hubs including SmartThings, Vera, Homeseer, Hometroller, Zipato and Open ZWave. As a ZWave Plus certified device, it works with Zwave and ZWave plus hubs.